I used an idea for making cakes I found online. 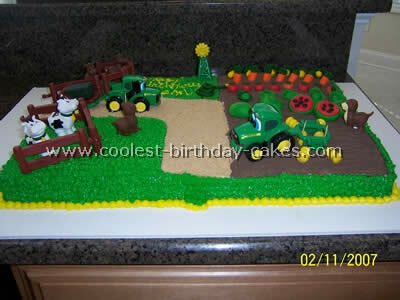 I started with a yellow cake mix and using buttercream icing I then separated the green and brown field. I iced the field smoothly and then used a decorator comb to make it look like it had been tilled then sprinkled a graham cracker, brown sugar and Oreo cookie mixture I had crumbled up for the dirt rocks. Then I added the fence, trees and tractor. I used a tip #233 for the grass and I was done. I never thought that making cakes was this easy. I am not good at making cakes so about a week before my son’s birthday party I made all of the animal figures, hay bales and flowers out of icing and kept them in an airtight container. 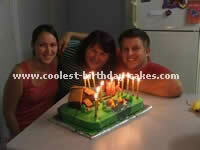 The day before the party I made a square sponge cake which I filled with jam and covered in butter icing. I then covered this in green icing and made the brown strips of fencing and stuck them on. 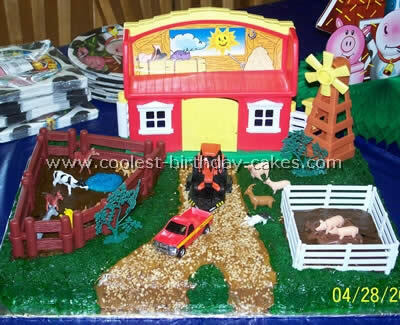 My son had a small toy dog kennel which I also covered in the brown icing to transform it into a barn. 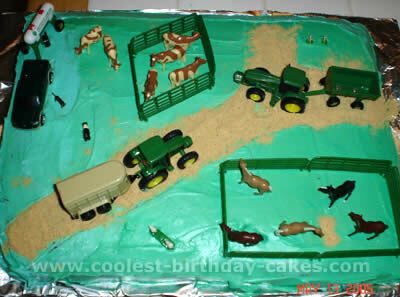 The pond was made with blue icing and was stuck onto the cake along with all the icing animals’, flowers and bales. To finish the cake off I made a sign with my son’s names on and put on some candles. The cake was a great success with everybody at the party! I love making cakes so made this cake for my niece’s third birthday. It was a hit! I used a loaf pan to construct the barn. I baked three of them and stacked them one on top of the other. The top layer is cut out like the roof of the barn. I laid a graham cracker on the top of each level to look like the roof. Then I used chocolate hazelnut spread used as glue to attach the chocolate Twizzlers cut into different sizes to create the shingle look. The hay stacks are made out of organic cake mix with confetti toppings poured into the batter to make confetti cake. I used mini cupcake holders with yellow icing and chopped up shredded wheat cereal to look like hay. The silo is made of standard cupcakes with the tops cut off to look almost the same size. The top one has a large top to look like a mushroom cap. The dirt is the chocolate part of Newman’s Oreo like cookies mixed with crushed vanilla and almond granola. The letters are made of white chocolate with food coloring poured into candy molds. The other cake is a quarter sheet cake made with organic white batter again with added confetti and frosted with brown butter cream frosting. I used hazelnut chocolate to hold the pretzels together for the corral area. Half of the corral is the dirt made out of Oreo cookie and granola and the other is butter cream frosting dyed green for grass. 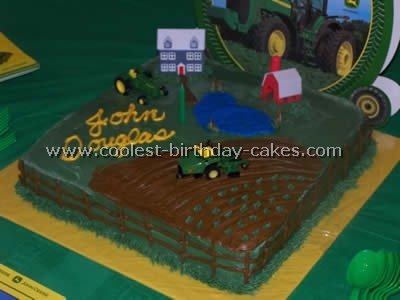 The straw field is made out of shredded wheat cereal with a John Deere tractor and a plastic farmer. The pig pen is made out of Hazel Nut chocolate with rubber pigs in it. For the pond I used a glass dish to cut out the size and then I made a hole and put the dish down in it and filled it with blue colored water. I initially wanted to have a yellow rubber ducky floating in it but I had a hard time finding them on such short notice so I found a toy lily pad and put a little turtle on it. The green grass around the pond is green dyed butter cream frosting. All the animals are toys that my niece loves to play with. Not only did she get a cute cake but she also got some new farm animal toys. 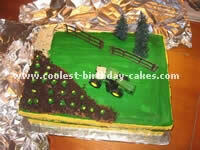 As you can see I love making cakes because all this is homemade except for the animals, farmer and tractor! This is my first paid cake. It’s my fourth cake ever made (with a theme/character). I have never taken a class in making cakes so I winged it. It is a double layer chocolate cake with chocolate frosting for the filling. 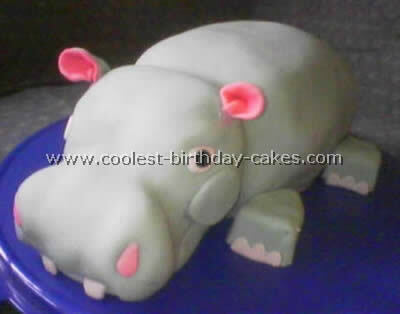 I frosted it with buttercream frosting colored. 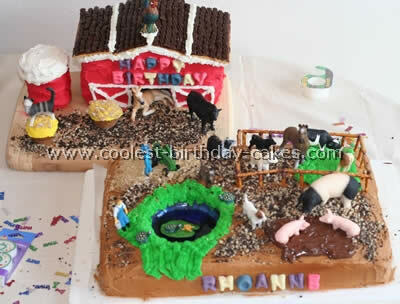 I then made a third 9×13 cake and cut it up to make the barn. It’s four layers tall; cutting part of it to make the roof. The barn is resting on its own cake platter (that I cut to make it into a square) on top of the wooden dowels I places to support it. It was a lot of fun to make! Good luck with your own attempts at making cakes! Making cakes is a blast and this one was no different. The cakes were box cakes I made a few days before and put into the refrigerator. The icing was Wiltons icing (the box mixes) then we colored the icing with Wiltons icing gel. We made the grass with coconut and colored it green and it sure was yummy. Then the cookies on the cake were bought at the Cookie Bouquet and we took the sticks off and stuck them on the cake. Rocks were rock candies bought at a local candy store. My son absolutely loved the cake and he got to help too so that was so nice. Decorating took a few hours but it was very worth it and I was so proud of the work my girlfriends and I put into this cake! Thanks girls! 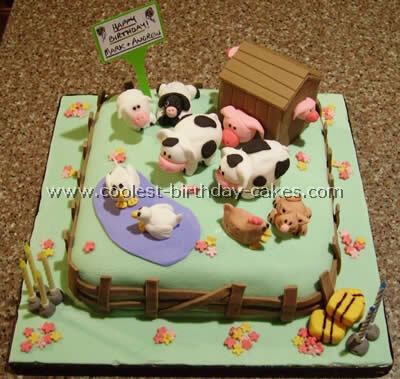 I made this cake for my son’s 4th birthday and he loved it (of course he is into farm animals and things like that). To make this cake I just used two cake mixes in a large rectangle pan that you get a Hobby Lobby and cooked according to the box. I made the frosting with Dream Whip and Jell-O pudding mix. 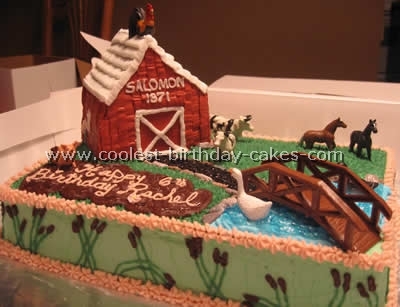 After the cake cooled I arranged the items where I wanted them to go, then I put tooth picks around the fences, barn and the road (so I would know where to put the different colored icing). Then I made the icing with Dream Whip. I put a little cake frosting coloring in a little frosting to make the colors that I wanted. Then I would frost an area the color that it should be and then take the tooth picks out. After I got the cake all frosted I stuck in the refrigerator until the next morning (I made this the night before). The morning of the party I put all of the items on the cake and waited until the party. 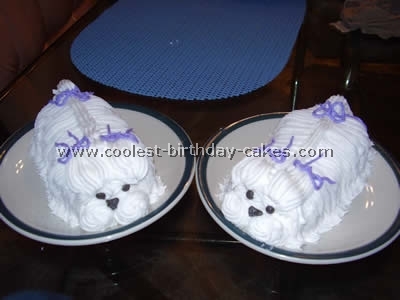 I got the idea for this cake from this site for making cakes. 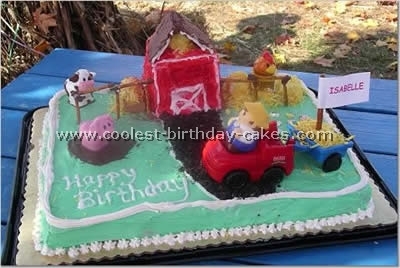 My son said that he wanted a farm/barnyard cake for his birthday so I went looking on the internet and found one that was similar to the one I made. Making cakes is so much fun and rewarding! This cake was made for a 6 year old. He wanted a farm/garden to go with his love for John Deer Tractors. I made two sheet cakes from a box and made some homemade Butter cream frosting. I started by frosting the garden area and the dirt road with white. I grinded up chocolate graham crackers in the food processor and sprinkled it on one end of the cake for the dirt in the garden over the white frosting. I then grinded vanilla wafers and sprinkled it for the dirt road. I colored my butter cream green for grass. I used the small star tip and piped out grass for the farm area and all around the edges. Then I used Fondant for all the vegetables, watermelon and the garden hose. I got creative with that! Color your fondant with gel paste from wilton and get creative with your favorite garden vegetables and fruit. I finished the cake with yellow butter cream around the bottom of the cake to kind of seal it all in. I used the little 20 piece set of John Deer tractor set to decorate. I believe this is what gave this cake so much character. This was fun making cakes that Carson loved and his mom was very happy too. Making cakes is such great fun. Good Luck! We were making cakes for our mum’s 46th birthday when we thought of this cake. This is her farm (not to exact scale) complete with lake, tractor, farm house, ducks and the family dog. The base is packet cake mix in traditional chocolate. 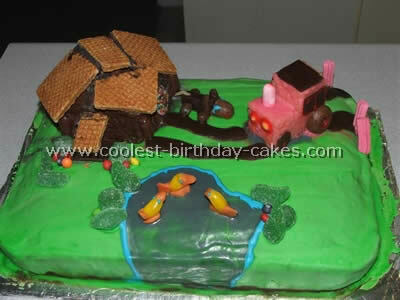 And the tractor and house are made from white mud cake. We used food coloring to make the colored lake and grass. There’s a drought here so the grass really isn’t that green here! The tractor wheels are choc aniseed rings and small buttons for the front. It was meant to be red but the food color didn’t quite stretch. The house has wafers for the roof and choc logs for the details. The ducks are made from marzipan and Jelly beans. My mum loved the cake and thought it was the best present ever! In fact it was the very first themed cake she’d ever got. 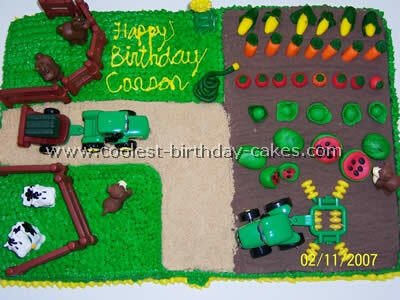 I made this tractor cake for my husband’s nieces’ son who was turning one. You got to love a rectangular cake!! The only difficult part here was tinting the icing the exact shade of green and yellow (I had to add some blue and black for the green and some orange to the yellow–just a little at a time!). The mom provided the tractor fences and trees. I used crushed sandwich cookies for the dirt and mini-wheats for the hay bales. 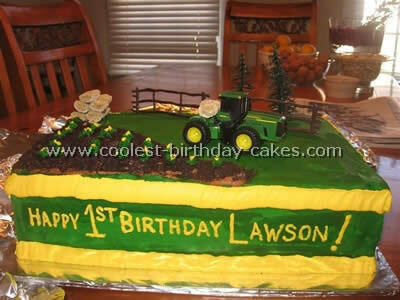 This tractor cake was a perfect compliment to all the John Deere decorations the Mom had gotten it made a great centerpiece prior to being cut. I love making cakes so this cake I made for my daughters’ 3rd birthday that we held at Cox Farm, a pumpkin patch and farm. I saw photos on making cakes on the web and made three Pillsbury yellow mixes and baked four 9 x 12s and put them together to make one double layer sheet cake. I froze the layers before evening with a knife putting on a crumb coat then I mixed white frosting with green coloring and frosted the farm yard. I baked a chocolate loaf cake froze it frosted it with red frosting and then placed it on the farm. I rolled some marshmallows in crushed frosted mini wheat to look like hay and balanced two graham crackers to make the bar roof. The white piping was very hard to do on the barn as you can see it tilted! I like putting chocolate frosting and placing pigs in it. Also we made a path and used Little People Farmers and animals. I printed a flag to put on the wagon with our daughters’ name on it. The cake was very tasty and everyone loved it! This is a chocolate square cake iced in dark green. I frosted one corner in brown and used my "cake rake" to make the appearance of rows. Then I iced a blue pond. I used pieces of toothpicks topped with a little brown icing and added leaves to make "cat tails" by the pond. I piped a brown fence around the sides and a little green grass. 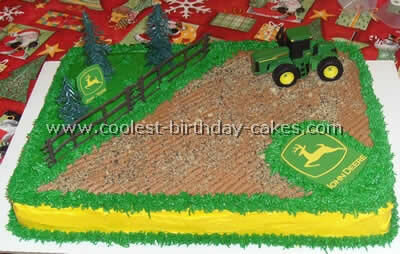 I then added the John Deere decorations for an awesome John Deere farm cake. Making cakes can be very fun! Use any type of cake mix and make a rectangular cake. Use white whipped icing and mix it with either green food coloring or green gel coloring (I used the gel). Use the green frosting as your base color. 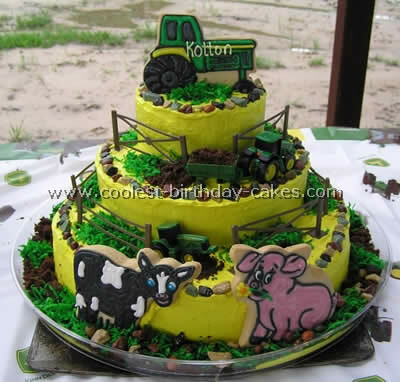 Then make a road through the center of the cake with crushed graham crackers and decorate with various farm animals and tractors. I used a farm vehicle kit that I found at Walmart, which came with the vehicles, animals, fences, and white barns. Good luck.